At age 47 I'm really starting to feel the aches and pains of a body that not only doesn't recover from injuries as fast as it used to but also is much easier to injure than it has been in the past. This is not a good thing for someone who still feels young at heart and still enjoys getting out and about on a skateboard as much as possible. Recently my skateboarding has been the cause of several arm and shoulder injuries. Not from falling but just from the very act of skateboarding. Specifically the action of swinging my arms around to maintain balance when performing even simple tricks. Some of it is probably a failure on part to do any stretching exercises before skateboarding. Something I've never ever had to do but am reluctantly taking on board if it means less injury. I'm also thinking that maybe the ease at which I do get injured could be partially due to diet. I'm not an unhealthy eater. In fact I lost 12 kilos last year through a change of diet, and have managed to keep the weight off ever since. However I do tend to eat the same foods daily because it's just convenient to know what to make for my meals without having to think too much about it. For that reason I've been considering taking a multivitamin supplement for a while. I mean there could be gaps in my diet, and maybe some of those gaps are contributing to the ease at which I sustain injury? That said, I'm both skeptical of multivitamins, and I hate taking tablets unless it's absolutely necessary (such as pain relief or headache medication). I really don't want to be one of those people taking a lolly bag full of tablets on a daily basis before I'm on a pension and actually need that amount of drugs just to stay alive. Despite that, I bought a bottle of a leading multivitamin brand and started taking one a day, just after breakfast. These tablets are targeted at adult males and are supposed to promote healthy skin, improve muscle function, increase energy, and improve immunity. All things that I could use a boost in. Today is day three of taking them. So far, I can't say I've noticed any real change. I haven't injured myself recently but I haven't really been skating on account of trying to make sure my body is fully recovered from all the previous injuries. We'll see how I go. If I do notice any dramatic changes I'll let you know. If you happen to take multivitamins, and feel they work, maybe you can recommend your brand to me and let me know how they've been effective for you. I take multivitamins, but mine are arthritis orientated at my age of 71yrs just turned, but I've been taking them since early 50s. I'm not over weight as you know, but I've got osteoarthritis of the lower back since early 50s, or that's where it started, so don't know if it's spread. The cartelidge in the last three bones was worn. I was told to go home and forget I'd got it, but that I might need physio later! (doctors' didn't believe in alternative therapies then) I started taking glaucosimine tabs, three a day which was said to help strengthen bones. Later, I got onto the 'one a day' which was more convenient if you were going out, as they have to be taken with or after food. I also got onto fish oil capsules, 3 a day, then the 'one a day' came out, which once again was more convenient. They are just more concentrated into one capsule or tablet. I later got rheumatoid arthritis in my hands, as my thumb and first finger on my right hand used to go red and look a bit swollen and hurt a bit. I go to a specialist at Vic Park for that, just every few months now, about twice a year. I was given a script to take methotrexate, which are very small orange tabs and only take once a week on the same day in the evening after food or with food. I have a blood test every 8wks to check that it's not affecting the liver, and mine is OK. The lab is only across the road from me and no appointment necessary. They send it off to my specialist. Now, I also have osteoporosis but don't know how badly. I take calcium tabs for that, ie: Caltrate one in the evening after food, which my specialist prescribed. They are non-prescription though. I used to take one cod liver oil capsule once a day, but Natures Own discontinued them for some reason and there were 300 in a bottle. They were said to give you a healthy immune system, but the methatrixate was to slightly lower my immune system as rheumatoid is said to be attacking your system but they seemed OK. I've got onto some capsules now that are a combination of red krill oil, glaucosimine, and chondroitin which is supposed to work like a pain kiler for arthritis etc. I was taking red krill in a separate capsule, three a day I think but found these which I have to take three of. They are Bioglan called Joints Plus with 90 capsules which last me about a bit over a month. I go to the Discount Warehouse Chemist for them and try to buy them when they are on special, as they are over $30 or a bit over $25 when on special. I was thinking for you, that you would be needing calcium for healthy strong bones and the fish oils, especially the red krill which is supposed to be better than the ordinary fish oil. The combination I'm taking now is equal to the amounts in each tablet to the separate doses I was taking before. You could ask the chemist what would be best to take or ask your doctor if they are willing to advise these alternatives of course. Calcium is important though and mainly from your foods, such as dairy, milk, cheese, eggs etc. Now they tell us we should have the full fat milks and cheeses and not the low fat variety. They used to say that dairy was bad for your heart, so you don't know what to believe! A good dietician might be an idea, and for vitamins. You haven't to let vitamins replace your foods, as it's best to get it from food, leafy veg and fruit too etc, but just use the vits as suppliments to your diet. I forgot to fill in my name etc, that's why it's saying two comments and 'unknown' etc. Oh, forgot to say, you'll need longer than three days to know if they're doing any good. About a fortnight to a month really. Daily exercises are good for keeping muscles supple, even walking, so you walk your dog so that should help. You probably don't want to go to a gym, but these personal trainers are said to be good, but don't know if they advice on foods too. I think a yearly sub is cheaper. I'll just reply here rather than on both your comments (I deleted the comment you removed completely - in case you were wondering). I've got the exercise thing covered, on top of walking the dog (about an hour each day), I do 40 minutes on my orbital walker each weekday. So if I skateboard daily (which I will once the rain gets less frequent), that's even more exercise again. Most days I try to fit in a minimum of 20 minutes skateboarding but more if I have time. I personally don't like attending gyms because I do have the discipline to exercise regularly at home (which is cheaper) and I think the travel time to and from the gym could be better spent doing something more productive. 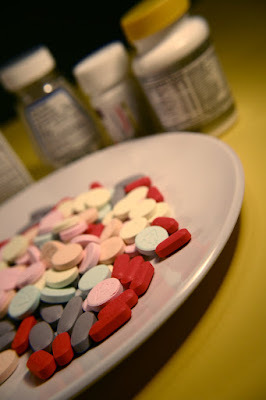 The Multi-vitamins I chose are Centrum Advance tablets for adults (not specifically men as I wrote in this post - which I had looked at that version). 60 tablets in a bottle @ one per day. These are a supposedly a good all round multi-vitamin and include Calcium for bone health. When I wrote this post I'd only taken them for three days but the actual post went live on my blog about a week later, so at this point I've taken them for almost two weeks. At this point it's still hard to say if they're having a positive effect in areas that would be noticeable - such as increased energy. Can't say I particularly feel more energetic. I think the real test might be when I run out. I'll stop taking them for a month or two and see if there's any obvious difference. I'm trying to avoid taking lots of different tablets at this point in my life. I don't really even want to take these but, whilst I do eat fairly healthily, I tend to eat similar meals every day. I thought a multi-vitamin might be a good idea to fill in certain gaps. Well, it can't harm to try. I've heard of that brand for other things. I didn't think you'd like gyms, but just some thoughts and suggestions. You can look on the 'net of course for advice on vitamins and what's good etc, but you have to try to sort out what sounds good and what isn't, as as you know you can't believe all you read on the 'net. It depends who it's by and if it's proper qualified people. Apart from my two prescription tabs (I take 1 Plaquinel tab for rheumatoid as well I night after meals) I only take the Bioglan which are called Red Krill Oil Active Joints Plus with the three combos, and I take the Panadol Osteo tabs, 2 in morning and two at night which last for 6-8hrs, so I could take another two during the day after 8hrs, but don't like to take too many. They don't do anything for my shoulder and arm even though each tab contains 650mgs. I'm waiting to get a joint replacement in my left shoulder since Aug last year to see a surgeon, and I rang up a few days ago and I've just received my appointment for Nov 17th at 12-50pm at RPH. You have to walk through the hospital and cross the road and go to Goderich St behind the St Mary's cathedral apparently. I won't get it seen to 'til after Christmas, but I wouldn't want to be incapacitated then by only having one arm to use, as when I looked on the 'net a few months ago, it's 6-8 wks recovery and your arm is numb at first. More on that later probably on our Family web site so the rest of family can read it, because I don't think they take too much notice when I'm telling them things, but don't see them too many times.